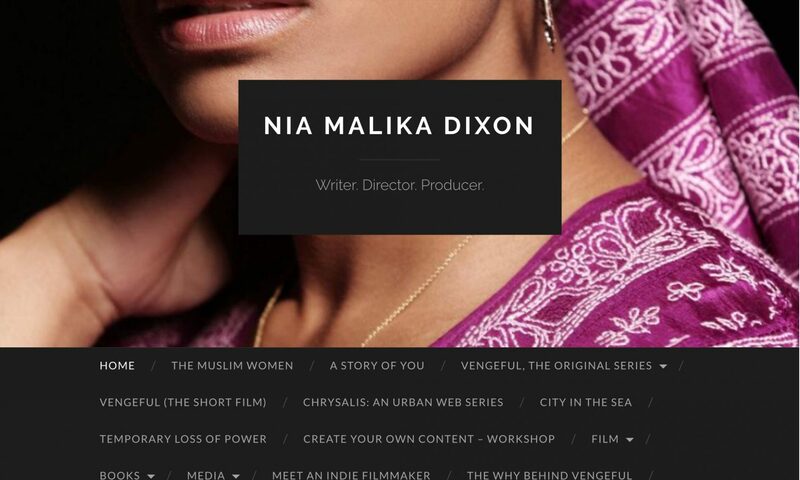 Nia Malika Dixon – Writer. Director. Producer. Born and raised in Baltimore, MD, Nia has been a writer since the day her mother first put a pencil in her hand. Although writing has always been Nia’s passion, her mother’s emphasis on education led Nia to become an elementary school teacher. She has taught children for more than twenty years and raised her own two children along the way. However, Nia’s passion for storytelling cannot be quenched. After years of writing for national magazines, completing two anthologies of poetry, writing children’s stories, drafting a novel, writing short stories, short films, and completing two feature film scripts, Nia made the bold move to Los Angeles in 2005, to pursue the dream of reaching global audiences with her writing. Nia Malika Dixon speaks at her alma mater, Western Senior High School, the oldest all-female high school in the United States. Created in 2006, the short film Temporary Loss of Power, which explores the human dynamic of gender, race, and power, was her first foray into filmmaking. Then, in 2007 Nia worked on a short sci-fi film, called F*ck you, Pay Me, with indie writer-director Chris Derrick. Since then, Nia has been writing, and planning projects for her own independent production company, Audaz Entertainment. In 2008, Nia received a surprise birthday present in the announcement of her being matched with her requested mentor, Catherine Hardwicke through the Women In Film Mentor Program. Since Ms. Hardwicke’s film Thirteen, Nia has been following Catherine as a source of inspiration for her own filmmaking career. Under the banner of Audaz Entertainment, in April 2009, Nia hosted the 1st Annual Muslim Artists Expo in Baltimore, MD to feature the work of graphic artists, photographers, spoken word artists, and musicians. In the same month, Nia’s script, Chrysalis, a feature-length, crime drama, was selected as a Quarter-Finalist in the 13th Annual Fade In Awards. It received high marks for the premise, structure, characterization, dialogue, and overall storytelling. That same year, Nia also worked as Associate Producer on the indie documentary, Deen Tight, a film that explores the world of Hip-Hop and Islam. Nia is currently shooting a documentary in both L.A. and her hometown, Baltimore, Maryland. Not Your Average tells the story of her venture into filmmaking as an African-American, Muslim Woman. Nia was a finalist for the AFI 2010 Directors Workshop for Women and was preparing to shoot her next short film, Chrysalis, in the fall of 2010. Nia worked with her mentor, Catherine Hardwicke, whose film The Girl with the Red Riding Hood received the green light from Warner Brothers and began shooting July 2010. Catherine Hardwicke and Nia were interviewed for KCET, in February 2010 to reflect upon the Oscar nominations of Kathryn Bigelow for Best Director and Best Picture. To watch the interview, visit http://kcet.org/socal/2010/02/celluloid-ceiling-women-directors.html. Nia is currently in post-production of her original series, Vengeful, the first police detective series led by a Black woman, since 1974’s Get Christie Love. Nia is also the mother of two college students with special needs, including her son with Autism. Embracing the storytelling passion and filmmaking vision of Nia Malika Dixon, the partners and executive staff of Audaz Entertainment have come together for the distinct purpose of creating quality, compelling, diverse & inclusive, motion pictures for worldwide exhibition. Learn More About Nia’s Production Company, Audaz Entertainment, Inc. On the Official Website: Audaz Entertainment, Inc.
All our content is GONE, because it costs money to make the quality content our audience deserves!